The timeless symbolism of the Irish Claddagh combined with elegant Celtic open weave love knotwork gives our 316 L Stainless Steel Claddagh and Celtic Knotwork Circle Pendant a fresh spin on the popular "O" jewelry! 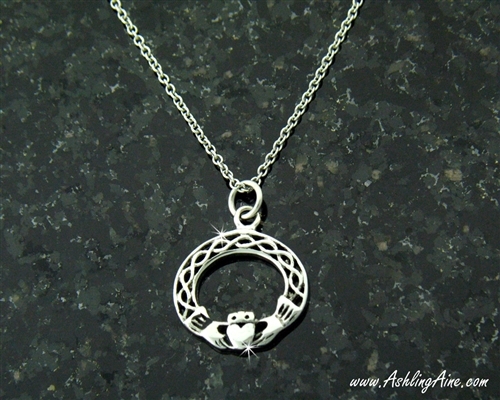 Like a woven silver bridge, the knotwork arches over the Claddagh to form an unending loop of Celtic design. Your necklace will arrive in a beautiful velvet pouch ready for gift giving. 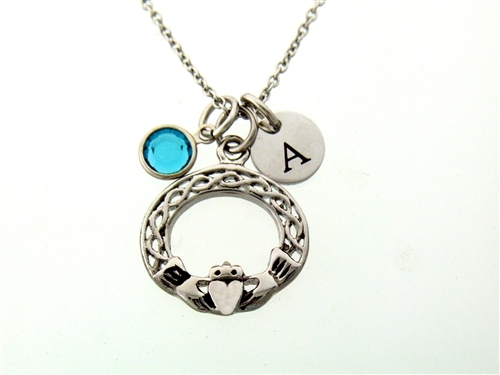 We can add 316 L Stainless Steel initials or CZ Birthstones to make this a very personal gift! Leave us a note and we can advise of additional cost. Necklace is on a 316 L stainless steel chain 16"-20"